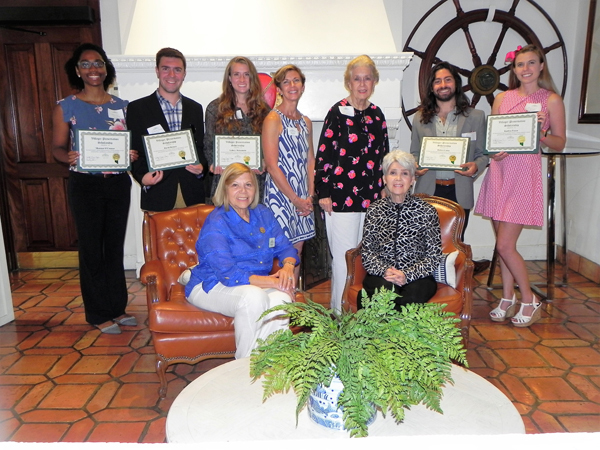 Scholarships | The Villagers, Inc.
Each year The Villagers award scholarships to students with a demonstrated interest in historic preservation, a noteworthy academic record and the potential to make a significant contribution to historic preservation in the future. The purpose of the scholarship program is to foster professional development in historic preservation in the State of Florida. The Villagers recently awarded $35,000 for college scholarships to deserving students with an interest in architectural historic preservation and restoration. Twelve students were selected from the field of applicants based on scholastic standing, recommendations, samples of their work and their statement of interest in preserving architectural past. Recipients from the University of Miami (UM) are senior Sydney Matsumoto and previous recipients, juniors Shannar O’Connor and David Holmes. All three are in the five-year School of Architecture program. Florida International University (FIU) recipients include graduate student Robert Colón, a junior seeking a Master of Landscape Architecture, and Kaitlyn Fuson a senior in the Master of Architecture program and second-time recipient. Mayrelis Perez the recipient from the University of Florida is working towards a Master of Historic Preservation. A portion of the scholarship funds are designated for deserving students graduating from DASH, Miami-Dade County’s magnet school for architecture and design. The winners of the award are able to designate the scholarship to the university of their choice. Graduating seniors selected were Yunru (Daisy) Chen, Miami; Adam Samson Margolis, Surfside; Frederick (Didi) Rapp, Key Biscayne; Dani Simons, Miami; Carolina Zuniga, Doral; and Ruth Suarez, Pembroke Pines. (Seated): Villagers Margie Palmer and Renee Belair, co-chair; (standing L-R): Shannar O’Connor, David Holmes, and Sydney Matsumoto, from UM; Villagers Joanne Meagher and Verna Hodges; and Robert Colón and Kaitlyn Fuson from FIU. Not pictured: Victoria Champion, co-chair.